Follow-Up Emails are a part of email automation and are here to help you engage with attendees in better ways. In the emails, attendees are asked to provide feedback using an evaluation form. The platform sends the emails to the attendees who participated in a workshop, on the first, third and seventh day after the event. As soon as an attendee fills in an evaluation, she gets no more follow-up emails. Thanks for attending a Scrum Master event in Pittsburg. As a follow-up, I’d love to hear what you think about the experience. It will only take a minute to evaluate the event, and I greatly appreciate all the feedback. Please follow this link to take part. To customize the follow-ups, find Mails tile on the event dashboard and click Edit in Follow-Up Emails section. On the sidebar, Workshop Butler shows you the dates when each follow-up email is sent. These dates depend on the end date of your event. 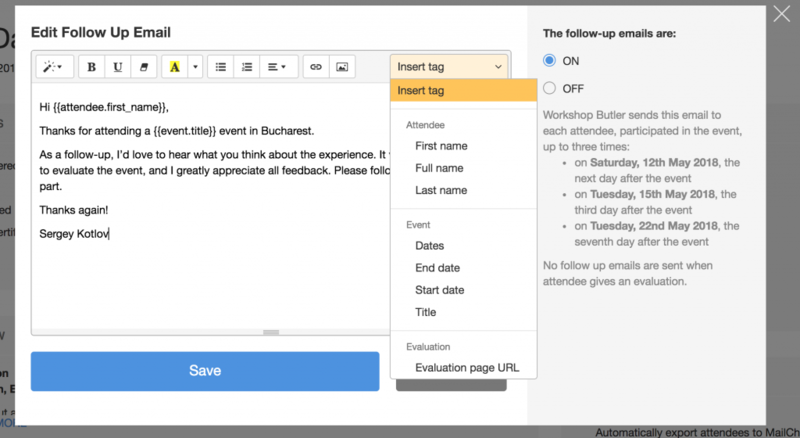 If you do not want to send the follow-ups to attendees, you can switch them off by selecting the option the sidebar and clicking Save. You can find available tags for the follow-ups in the select box in the top right corner of the editor. When you duplicate an event, the follow-ups template is not copied. You need to update it for each event manually.